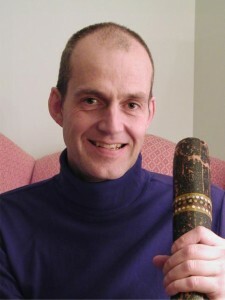 Brian Pertl is an ethnomusicologist, didjeridu player, and Dean of the Lawrence Conservatory of Music. A graduate of Lawrence University, Pertl spent a year as a Watson Fellow in Australia and Tibet studying Aboriginal didjeridu and Tibetan Buddhist sacred music. This spectacular musical adventure launched Pertl into an eclectic musical life. He received his MA in Ethnomusicology from Wesleyan University; lectured and performed across the United States; released three CDs including a didjeridu instructional workshop, and a recording of a performance in the great Cistern at Fort Worden where his piece Land of Snows was first performed. In addition, he spent 16 years as the manager of the Media Acquisitions Group at Microsoft, where he helped to select, caption, and license all of the music found in the Encarta Encyclopedia and the Encarta World Atlas. In 2008 he returned to Lawrence University to become Dean of the Conservatory of Music. Pertl’s presentation will focus on the importance of a liberal arts education to prepare students to fully engage with, and thrive in the ever-changing, massively multi-faceted, increasingly collaborative world of the 21st century. I propose that the liberal arts ideal should not be confined to a relatively small number of ivy covered campuses scattered across the United States, but rather it should be foundational throughout every stage of our education system, particularly the K-12 curriculum. I will make this argument from the viewpoint of music, since this is my particular training and passion. In my performance oriented, interactive presentation, I will show how new approaches to integrating music into K-12 curriculum can foster the creative, innovative, improvisational, and collaborative thinking that is core to the liberal arts ideal, but is so woefully lacking in our K-12 schools. I will then expand on these examples to illustrates how immersive music education can positively impact all other facets of their educational journey. Joining me in my presentation are master musicians, Dane Richeson, Mark Urness, and Matt Turner. Their highly improvisational performance which will continue throughout the talk, will be an integral part of the presentation. This will be a non-stop musical illustration of why the liberal arts are alive and well and ready to redefine education in the 21st century. In the spirit of ideas worth spreading, TED has created a program called TEDx. TEDx is a program of local, self-organized events that bring people together to share a TED-like experience. Our event is called TEDxLawrence, where x = independently organized TED event. At our TEDxLawrence event, TEDTalks video and live speakers will combine to spark deep discussion and connection in a small group. The TED Conference provides general guidance for the TEDx program, but individual TEDx events, including ours, are self-organized. In the spirit of ideas worth spreading, TED has created a program called TEDx. TEDx is a program of local, self-organized events that bring people together to share a TED-like experience. Our event is called TEDxLawrenceU, where x = independently organized TED event. At our TEDxLawrenceU event, TEDTalks video and live speakers will combine to spark deep discussion and connection in a small group. The TED Conference provides general guidance for the TEDx program, but individual TEDx events, including ours, are self-organized.